Holy cow! Two new Kalamazoo area blogs in one day?! It’s been a long time since I’ve been able to do that. When I get a chance, I like to give J an hour or so of baby-free time so she can do things she can’t when L is around. Moms out there know how great a shower without little hands reaching under the door can be. I was in the mood for pizza and since I wanted to get away for a little while, I looked up a new place that just opened near Long Lake in Portage. Spicer’s Pizza is on South Sprinkle Road where the road runs between Long Lake and Austin Lake on the way to Vicksburg. 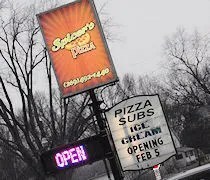 According to an article that was in the Kalamazoo Gazette a couple weeks ago, the pizza place was opened in early February by a couple of brothers to honor the memory of their mother. The building used to be Fast Freddy’s Pit Stop and it has apparently been heavily remodeled. 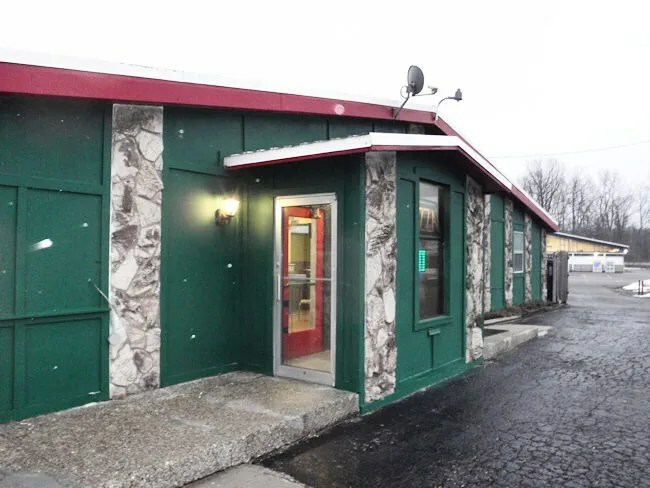 Having never been to Fast Freddy’s, I have no direct knowledge of what the building used to look like. The space is divided in to two distinct areas. When you walk in the door, there’s a large order counter with a Coke machine and a rotating rack warmer for pizza by the slice. I never looked in to the dining room area to see how big it was, but dine in is a possibility if that’s what your in the mood for. I had called in my order for an 18″ BBQ Specialty Pizza and an order Hot Pepper Cheese Balls and it was waiting for me when I walked in. The bill was a right around $27 since I went with the specialty pizza which I paid for with my credit card. After a quick stop at Speedway to pick up a couple Pepsi’s on my way home, L and I got home just as J was finishing up with her shower. We popped open the Styrofoam box of Hot Pepper Cheese Balls first since we didn’t actually know what they were when we ordered. 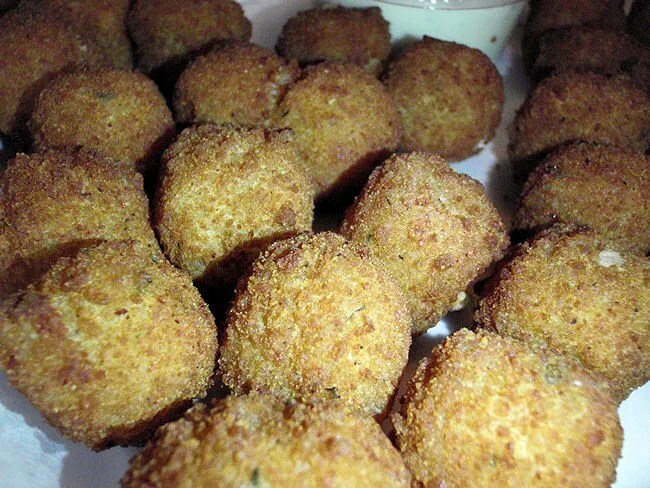 They were small, deep fried, breaded pieces of pepper jack cheese. They came with some kind of a ranch dressing for dipping which J said was sweeter than typical ranch. I didn’t want any dipping sauce. I love deep fried cheese just as it is. The pizza was a somewhat thin crust cut in to squares (instead of triangles) and topped with a home made BBQ sauce (instead of marinara), chicken and double mozzarella (the pizza also comes with red onions, but we left them off). 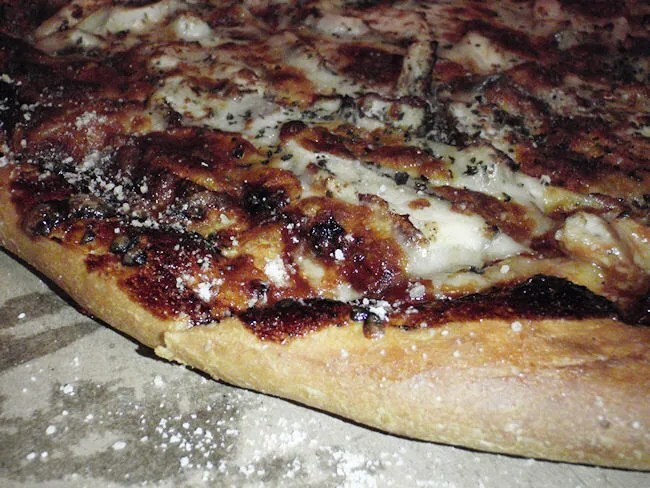 There was also a generous dusting of Parmesan cheese over the whole pizza. The first thing I will say is that I love the fact that this pizza is not a typical eight slice thicker crust pizza. The crust was a little too soft, but it was much thinner than the typical pizza place. If the crust had more of a bite to it, I think we would have really loved it. The pizza itself was quite tasty. The home made BBQ sauce was sweet and tangy. It was generously applied to the top of the crust and then topped with a generous helping of cheese. 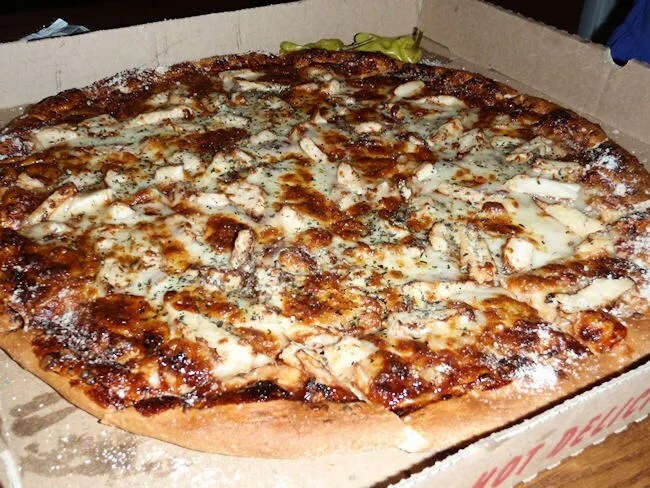 There was at least one piece of chicken on each square of the pizza that was then topped with Oregano and cooked to a slight golden brown. Whenever I write about new pizza places, my main complaint is that the crust is usually all the same. Spicer’s is not the same. Maybe they just tricked me with cutting it in to squares…who knows. The crust needs to be a little more crispy for me, but overall, the pizza was pretty good. Thanks, we at Spicer’s are working hard to please all customers. Please give our regular pizza a shot as well. Any and all comments are appreciated! Thanks again for the review!! Spicers pizza is soooo yummy 🙂 🙂 great prices ,great atmosphere and the staff is very friendly. Everyone needs to try it.